Princesses and Pixie Dust: A Pixie Dust-ed Trip Report... Sneak Peek! A Pixie Dust-ed Trip Report... Sneak Peek! Hello there, princes and princesses! Well, a couple of weeks have gone by with things being quiet on the Princesses and Pixie Dust blog front; between last-minute shopping, family time, and holiday meal preparations, my schedule was just a little too nuts to do anything else! Still, in the midst of holiday madness, I have managed to squeeze in a couple of jaunts to the most magical place on Earth. Yes, I am back in the proverbial Promised Land of the Sunshine State, where I reside just a few hours away from Walt Disney World. I promise that a proper trip report is on its way, but in the interim, I thought I'd give a little sneak peek into my adventures at the Magic Kingdom a few weeks ago! 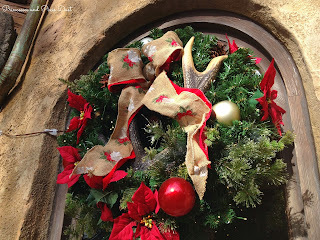 To give a brief introduction, this particular day was a park-hopping adventure from Magic Kingdom to Epcot and onward to some of the deluxe resorts to check out their famously stunning Christmas decorations... and believe me, they did not disappoint! When one thinks of the Magic Kingdom at Christmas, the first image that rushes to mind will inevitably be the gargantuan tree that towers over Town Square and casts an aura of holiday cheer all the way down Main Street, U.S.A.- and understandably so; the magnificent display all but commands total awe and amazement as soon as guests enter the park. It is the details in Christmas decor throughout all areas of the park, however, that caught my eye on this most recent trip. Pictured here is a wreath that adorned a window of Gaston's Tavern (though, let's be real- the antlers are a dead giveaway! ), one among a smorgasbord of decorations, each themed as impeccably as only Disney can! Another highlight from this Disney day was a long-overdue visit to New Fantasyland's freshest addition: Princess Fairytale Hall! While I was away at school this fall, I wistfully watched every preview and update until I was green with envy at my inability to visit the princesses' new meet-and-greet location! Luckily, my visit to the new royal roost proved more than worth the wait. Between the beautiful portraits that grace the walls of the entrance hall and the minute (but effective) details implemented by Imagineers, the attraction is so much more than a photo opportunity. 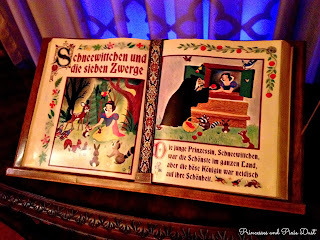 One of my favorite Imagineering easter eggs in the Hall is this fairy tale book, the pages of which are opened to the story of Snow White, who so graciously sacrificed her classic dark ride to allow the construction of this home for herself and her regal friends... a kind princess, indeed! Amid the hustle and bustle of Walt Disney World's parks (especially during the holidays), the resorts offer a welcome respite in the middle of the day, with unique and festive decorations to boot! 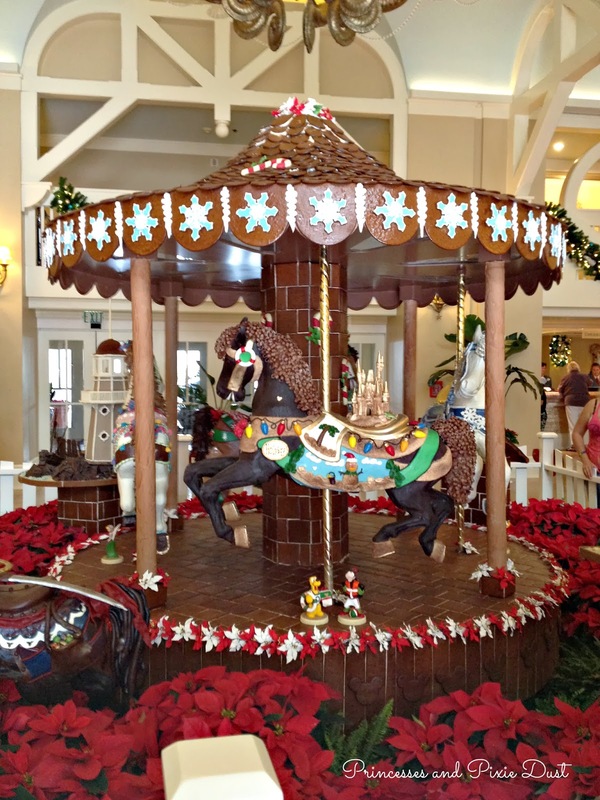 In my meanderings through the Epcot resort area, I stumbled across this charming gingerbread carousel in the lobby of the Beach Club Resort. 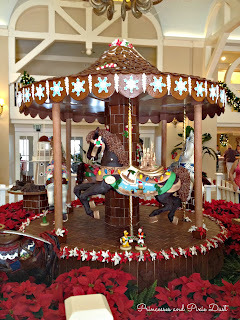 Aside from being adorable and filling the area with a tantalizing spicy aroma, the working merry-go-round gave the resort just the right Christmas-y touch! I promise I'll get the trip report up as soon as I possibly can! I hope all of you had a merry Christmas, filled to the brim with magic, love, and yuletide goodness! Kill, Refurb, Marry: Thrill Ride Edition! 'Tis the Season... for TV Specials!